Any created object can be saved as a template. These templates can then be instantiated elsewhere as objects that inherit the template’s properties. This can save a lot of tedious work of setting up the object type and properties, or even just finding the right tile in the tileset. Each template is stored in its own file and they can be organized in directories. You can save templates in either XML or JSON format, just like map and tileset files. A template can be created by right clicking on any object in the map and selecting “Save As Template”. You will be asked to choose the file name and the format to save the template in. If the object already has a name the suggested file name will be based on that. 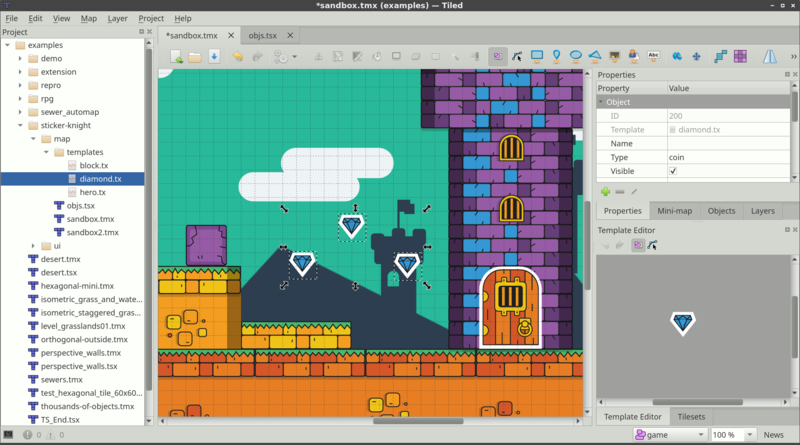 You can’t create a template from a tile object that uses a tile from an embedded tileset, because template files do not support referring to such tilesets. Working with templates is done through the Templates view. The Templates view is divided into two parts: the left part is a tree view that shows the template files in a selected directory and the right part shows a preview of the selected template. Template instantiation works by either dragging and dropping the template from the list of templates to the map, or by using the “Insert Template” tool by selecting a template and clicking on the map which is more convenient when you want to create many instances. Selecting a template will show an editable preview in the Templates view and will show the template’s properties in the Properties view where they can be edited. Changes to the template are saved automatically. All template instances are linked to their template, so all edits will be immediately reflected upon all the template instances on the map. If a property of a template instance is changed, it will be internally marked as an overridden property and won’t be changed when the template changes. Detaching a template instance will disconnect it from its template, so any further edits to the template will not affect the detached instance. To detach an instance, right click on it and select Detach. Resetting overridden properties individually (#1725). Handling wrong file paths (#1732). Managing the templates folder, e.g. moving, renaming or deleting a template or a sub-folder (#1723).